Bats are social mammals that use a repertoire of vocalizations to communicate with each other and to move around in the environment. 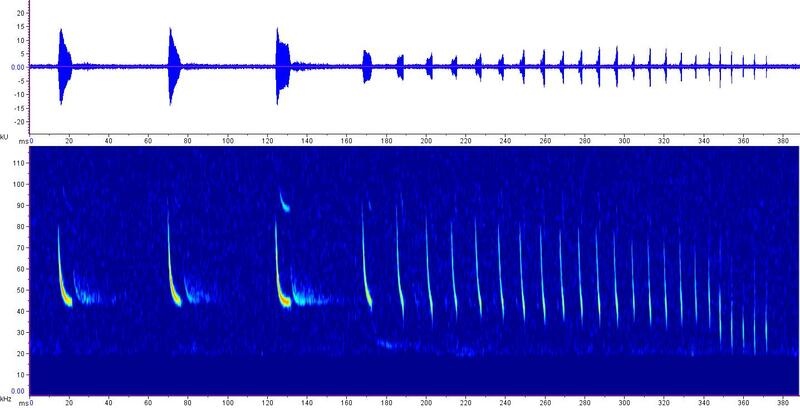 To detect obstacles and prey in their environment, bats emit a series of ultrasounds, very high-pitched sounds above 20,000 Hz, beyond our range of hearing. As a bat flies and calls, it listens to the returning echoes of its calls to build up a sonic image of its surroundings. 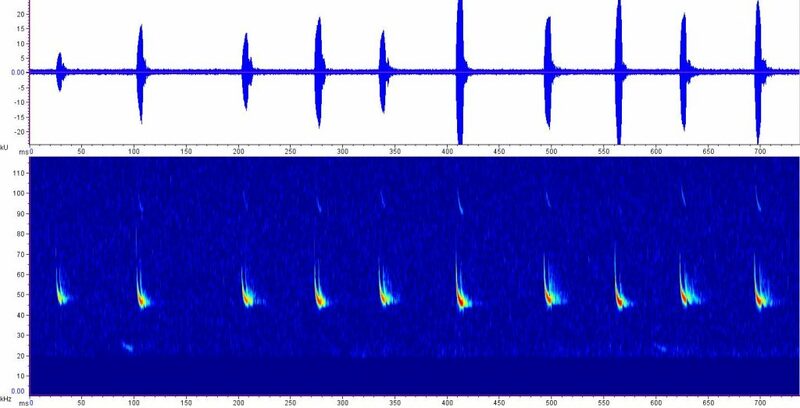 Bats can tell how far away something is by how long it takes the sounds to return to them, how big the target is based on the strength of the returning signal, and what shape the target has based on the spectral pattern of the returning sound waves. We call this process echolocation. Individual bat species echolocate within specific frequency ranges that suit their environment and prey types. This means that we can train ourselves to identify many bats by listening to their calls with bat detectors. Let’s LISTEN to recordings of the little brown bat (Myotis lucifugus) and the big brown bat (Eptesicus fuscus) for comparison. – But how can we listen, if we cannot hear their calls? Let’s use a trick: When we slow down the recordings by a factor of 10, the calls are transposed to 10 times lower pitch and become audible to us. Note: To make the sounds visible in sonograms we plotted frequency in thousands of cycles per second (kilohertz, kHz) on the vertical axis versus time in seconds on the horizontal axis. The varying intensity of colors ranging from dark blue (low intensity or quiet) to red (high intensity or loud) indicates the amplitude or loudness of each call. Amplitude is also shown in the top part of each figure with larger waves representing louder calls. 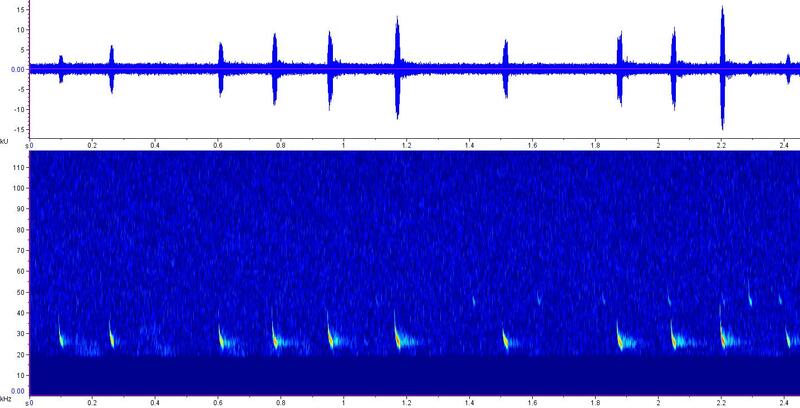 Little brown bat: Calls last from less than one millisecond (ms) to about 5 ms and sweep from 80 to 40 kHz, with most of their energy at 45 kHz. Big brown bat: Calls last several milliseconds and sweep from about 65 to 20 kHz, and are thus lower pitched than calls of little brown bats. When closing in on prey, a bat may emit 200 calls per second. What might sound to us like the bat is getting excited – don’t you talk faster when you are excited about telling something? – this rapid series of calls actually helps the bat to pin-point the exact location of its prey, then it swoops in, and GULP – dinner is served, or not! We hope you enjoyed listening to these bat sounds; if you have any questions please contact Angelika Nelson.794@osu.edu, curator of the animal sound archive at The Ohio State University. All recordings are archived with the Borror Laboratory of Bioacoustics (BLB.OSU.EDU) at The Ohio State University. Posted by nelson.794@osu.edu at 2:22pm August 10, 2017 Posted in Education, Events & Outreach, Local Fauna and tagged bat, echolocation, library exhibit. Bookmark the permalink. Nice post, I really enjoyed hearing the feeding buzz. What an interesting post – thank you for this!